Perth - South Africa and Australia will both be forced to call on fringe players when the number one ranking in Test cricket goes on the line in the final Test starting Friday in Perth. After a tame draw in the series opener in Brisbane, South Africa's batting heroics in Adelaide, led by a defiant unbeaten century from debutant Faf du Plessis, ensured the second Test also ended all-square despite a tense and dramatic last day. And it means both sides will tread the WACA ground with the chance to end the series as the top team in Test cricket. A win for South Africa, or a draw, would see the Proteas retain their position atop the rankings, while an Australian victory would put them back in the number one spot they last held more than three years ago. Complicating matters are several forced changes as the competitive nature of the first two Tests takes a heavy toll, with just a three-day break between matches. South Africa are likely to be without all-rounder Jacques Kallis, who played a crucial role in saving the Adelaide Test with the bat and exacerbated a hamstring injury. But skipper Graeme Smith is leaving the door open. "He is definitely not going to bowl but he could play as a batter," said Smith. All-rounder Ryan McLaren, who played one Test against England in 2010, has been added to the squad as cover. The tourists are also waiting on the fitness of seamer Vernon Philander, who was a late withdrawal from Adelaide with a sore back. Rory Kleinveldt replaced Philander at the last minute and after dismissing the Australian top three in the second innings is hoping for a berth in Perth. Spinner Imran Tahir faces the axe after a demoralising outing in Adelaide. Australia go into the Test without young quick James Pattinson, ruled out for the rest of the summer with a side injury. Pattinson joined fellow paceman Pat Cummins (back) on the long-term sidelines and there is concern that experienced fast bowlers Peter Siddle and Ben Hilfenhaus will struggle in Perth after their final day exertions in Adelaide. The Australia selectors have added three fast bowlers to a 14-man squad for the final Test. Uncapped pair Josh Hazlewood and John Hastings, who have both represented Australia in limited overs cricket, come in along with forgotten quick Mitchell Johnson, while Mitchell Starc, 12th man in the first two Tests, looks to win promotion. Left-arm Johnson, the ICC Player of the Year in 2009, has not played Test cricket since facing the Proteas at the Wanderers last November, but has 190 wickets in 47 Tests. He also boasts a superb record at his adopted home ground, with 30 Test wickets at 18.13 in four WACA matches. "Hilfy and Sids have had a really heavy workload of bowling a hell of a lot in the last couple of weeks in both Test matches," Clarke said. "I think we need to see how the boys pull up. "He (Johnson) has been bowling really well in Shield cricket and in conditions he loves in Perth, where he's had a lot of success. They're all very handy fast bowlers to be taking to Perth." All-rounder Shane Watson returns from injury at Rob Quiney's expense, while former captain Ricky Ponting retains his berth, despite mounting speculation over his future after making just 20 runs in the first two Tests. Ponting, 37, will play his 168th Test in Perth and tie Steve Waugh as the most capped Australian player. Coach Mickey Arthur doused speculation it would be Ponting's final Test, declaring the veteran part of next year's Ashes plans. South Africa have only played two Tests at the WACA, for one win and a draw. In 2005, they produced a match-saving second innings reminiscent of the second Test in Adelaide to deny the home side on the final day, with Jacques Rudolph scoring an unbeaten century. Three years later they produced one of the great run chases in history, scoring 414 to win on the final day with six wickets in hand. 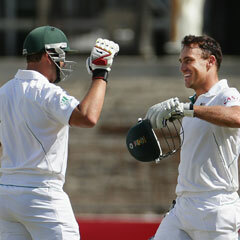 Graeme Smith and AB de Villiers both hit centuries.